Dragonair, a wholly-owned subsidiary of Cathay Pacific Airways has joined the growing family of international airlines at Clark Airport linking Clark to 18 cities in China and some 130 destinations worldwide. Clark Airport Corporation (CIAC) President and CEO Victor Jose Luciano and Dragonair's General Manager Wilson Yam recently led the start of the daily Clark-Hong Kong flights of Dragonair at the Clark International Airport in a simple send-off ceremony held at the Clark International Airport Passenger Terminal Building here. 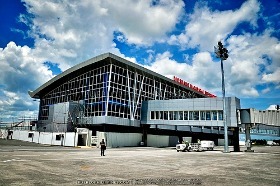 The entry of Dragonair will further boost the growth of Clark International Airport because "this airline offers travellers seamless connections to some 130 destinations worldwide," according to Luciano. Luciano noted that "Dragonair is a renowned China expert. The airline has routes to mainland China and to some 130 destinations all over the world." The integration of Cathay Pacific Airways and Dragonair linked their international destinations and domestic routes to China which brought forth significant benefits to the travelling public. It also further improved Hong Kong's position as a leading international aviation hub. The Cathay Pacific Group, including Dragonair and Air Hong Kong, now operate more than 150 aircraft. Its fleet is being significantly modernized with a total of 30 Boeing 777-300ER aircraft set to arrive this year. The new Cathay Pacific aircraft will form the backbone of the airline's ultra-long-haul passenger fleet. It has also upgraded its inflight product with new cabin designs being introduced on the entire medium- and long-haul fleet. The new cabins are, uniquely, being fitted in First, Business and Economy Class taking the travel experience to new highs. "Clark has positioned itself as a hub for low-cost carriers but is now attracting full-service carriers. These are now taking a serious look at Clark airport," said Luciano. The CIAC chief added that Dragonair will be the second legacy carrier that will operate in Clark airport. South Korea's Asiana Airlines is the first full-service carrier to locate in the Clark airport. Dragonair is an affiliate member of the Oneworld Airline Alliance. It has an all Airbus fleet of 31 aircraft consisting of A320s, A321s and A330s. Dragonair, together with its parent, Cathay Pacific, operated over 56,000 flights, carried nearly 25 million passengers and over 1.52 billion kilograms of cargo and mail in the previous year. The airline was established in Hong Kong on May 24, 1985 with its hub at Hong Kong International Airport. Luciano said Airphil Express also started their thrice-a-week Clark-Singapore and four-times-a-week Clark-Hong Kong international flights on May 17 and 18 respectively at the Clark Airport. Airphil Express is the budget carrier of the country's flag carrier, Philippine Airlines (PAL). "We welcome Dragonair and Airphil Express as the newest members of the international airlines operating at Clark International Airport," Luciano said. South East Asian Airlines (Seair) has also recently launched its Clark-Kalibo flights at Clark Airport which will further increase passengers going to the world famous Boracay Beach Resort. Aside from Kalibo flights, Seair-Tiger also flies to Singapore, Bangkok, Hong Kong and Kota Kinabalu. He said that CIAC is targeting at least 1.5 million passengers before the end of 2012 due to the additional flights in the international and domestic operations contributed by Air Asia Philippines, Airphil Express, Seair-Tiger and Dragonair. Aircraft movements at the Clark International Airport are at 292 flights per week both local and international. Clark Airport also caters to Cebu Pacific Air operations through international flights via Hong Kong, Singapore, Bangkok and Macau.The local carrier also has domestic flights via Clark-Cebu route. Other airlines operating at Clark Airport include Asiana Airlines and Jin Air via Clark-Incheon in South Korea. Luciano cited the growth of domestic passenger volume to 73,791 from the period of January to May 15 this year compared with 16,918 in the same period last year. "There has been an exponential growth in passengers, especially in the domestic front where we obtained a 336 percent increase from January to May alone compared to the previous year," said Luciano. This was due to the domestic flights of both AirAsia and Airphil Express that launched the Clark-Kalibo, Davao, Cebu and Puerto Princesa route last March 29. AirAsia Philippines also started their Clark-Davao and Kalibo flights last March 28 and Puerto Princesa last April 20. International passenger volume increased to 31 percent or 355,034 from January to May this year compared to 270,900 last year. "The entry of AirAsia, Airphil Express and the expansion of Seair-Tiger has brought tremendous growth to passenger volume in Clark," said Luciano. Luciano had earlier said that CIAC is fast tracking the construction of the P360 million Phase II project expansion of the Clark Terminal Building to accommodate the growing number of passengers using Clark International Airport. The current facility can handle two million passengers annually.